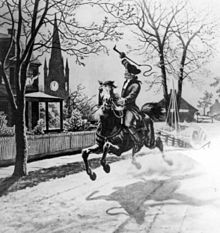 The Proclamation of Rebellion, officially titled A Proclamation for Suppressing Rebellion and Sedition, was the response of George III of Great Britain to the news of the Battle of Bunker Hill at the outset of the American Revolutionary War. Issued August 23, 1775, it declared elements of the American colonies in a state of “open and avowed rebellion.” It ordered officials of the British Empire “to use their utmost endeavours to withstand and suppress such rebellion.” The Proclamation also encouraged subjects throughout the Empire, including those in Great Britain, to report anyone carrying on “traitorous correspondence” with the rebels so that they could be punished. The Proclamation was written before Colonial Secretary Lord Dartmouth had been given a copy of the Olive Branch Petition from the Continental Congress. Because the king refused to receive the petition, the Proclamation effectively served as an answer to the petition. 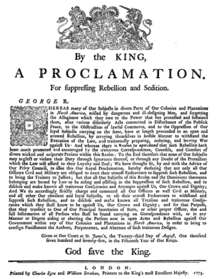 On October 27, 1775, King George expanded on the Proclamation in his Speech from the Throne at the opening of Parliament. 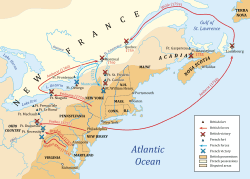 The King insisted that rebellion was being fomented by a “desperate conspiracy” of leaders whose claims of allegiance to him were insincere; what the rebels really wanted, he said, was to create an “independent Empire.” The king indicated that he intended to deal with the crisis with armed force, and was even considering “friendly offers of foreign assistance” to suppress the rebellion. A pro-American minority in Parliament warned that the government was driving the colonists towards independence, something that many colonial leaders had insisted they did not desire. The Proclamation and the Speech from the Throne undermined moderates in the Continental Congress like John Dickinson, who had been arguing that the king would find a way to resolve the dispute between the colonies and Parliament. 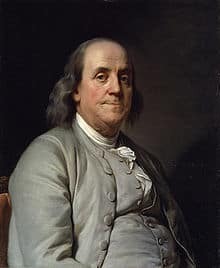 When it became clear that the king was not inclined to act as a conciliator, colonial attachment to the Empire was weakened, and a movement towards declaring independence became a reality, culminating in the United States Declaration of Independence less than a year later.